Ukrainian President Poroshenko Dismisses Envoy To U.S.
WASHINGTON, DC -- Ukrainian President Petro Poroshenko has dismissed his ambassador to the United States, whose tenure in Washington began under ousted former President Viktor Yanukovych and spanned the duration of Kiev’s year-long conflict with Russia. Poroshenko relieved Ambassador Oleksandr Motsyk of his post as Ukraine's envoy to the United States in an April 14 decree that did not specify the reasons for the dismissal. Motsyk, 59, had served as Ukraine’s ambassador in Washington since June 2010, when he was appointed by Yanukovych, who was chased from office by protests in February 2014. The United States has been a crucial ally for Kiev following Russia’s annexation of Ukraine’s Crimea territory in March 2014 and Kiev’s battle with Moscow-backed separatists in eastern Ukraine. Ukrainian media have speculated that Valeriy Chaly, deputy head of Poroshenko’s administration, could replace Motsyk. Chaly indicated on April 3 that he would accept the post should Poroshenko offer it. “It will be, I believe, the best choice for Washington and for our representation in the United States,” Klimkin said. 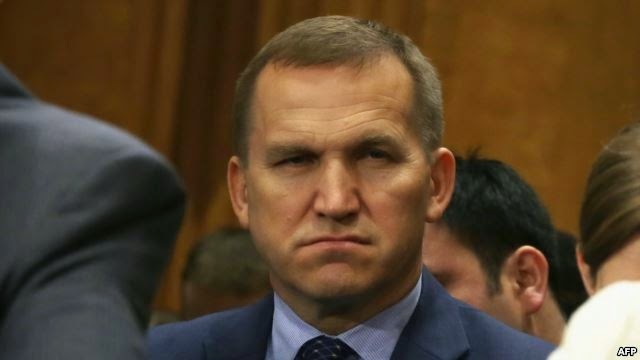 Like Klimkin, Motsyk is a career diplomat who served under Yanukovych, a Kremlin ally whose government faced accusations of massive corruption from political opponents and Western officials. Motsyk was a loyal envoy for Yanukovych who publicly lauded reforms undertaken by the former president and dismissed suggestions that Kiev was backsliding on issues like human rights, civil liberties, and political plurality. Steven Pifer, a former U.S. ambassador to Ukraine, told The Washington Diplomat in 2011 that he felt “some sympathy” for Motsyk. Also like Klimkin, Motsyk sided with the country’s new pro-Western leadership that took power after the deadly February 2014 street protests in Kiev that prompted Yanukovych to flee to Russia, which portrays the former president’s ouster as an illegal coup orchestrated by the West. Since then he has publicly appealed to U.S. officials to supply weapons Ukraine says will help it defend itself against separatists in eastern Ukraine. Western governments accuse Russia of backing the rebels with arms and personnel, which Moscow denies. In January, Motsyk asked EU foreign policy chief Frederica Mogherini in Washington whether Brussels would follow Kiev’s lead in deeming the rebels terrorists comparable to Islamic State militants. But sources in the U.S. Congress, which has aggressively pushed U.S. President Barack Obama to provide weapons to Kiev, gave Motsyk’s efforts to secure American assistance mixed reviews. One senior Senate aide said Motsyk and his embassy staff were not “hitting the pavement” in Washington and “engaging almost daily here like they needed too” given the enormity of the crisis Ukraine faces in its standoff with Russia. “I have nothing personal against the guy. And we wanted to help. There are ambassadors here I can email right away and get stuff right away when I need it. They just weren’t it. The crisis demanded more,” the aide told RFE/RL on condition of anonymity. Another senior Senate staffer speaking on condition of anonymity said that while he did not “engage too much” with Motsyk, he was “pretty impressed” with the diplomat’s staff, which has been “quite plugged in” to legislative action in Washington concerning the Ukraine conflict. “That’s at the staff level,” the staffer said. Other sources in U.S. policy-making circles said Motsyk’s dismissal may simply be part of a standard personnel rotation given that he had already served five years in Washington. The White House referred questions on Motsyk’s dismissal to the State Department and the Ukrainian Embassy in Washington. The State Department did not provide a comment when contacted by RFE/RL, and the Ukrainian embassy did not respond to an April 14 inquiry. Ukrainian-American advocacy groups welcomed Poroshenko’s move to replace Motsyk. “We needed somebody who can get results done, and frankly, at this time, I can’t say that we saw results coming out of his office,” Andrij Dobriansky, a spokesman for the Ukrainian Congress Committee of America, a New York-based advocacy group, told RFE/RL. The organization has been waiting for an ambassador with a “stronger voice” in Washington, Dobriansky added. In December, Obama signed legislation passed with bipartisan backing that authorizes -- but does not require -- the U.S. president to provide lethal military aid to Ukraine. But Obama has resisted providing these weapons despite the pressure from U.S. lawmakers and statements by top military brass supportive of such assistance. The Obama administration so far has earmarked nearly $200 million in nonlethal military aid for Kiev, though critics say this equipment will do little to help Ukraine defend itself against Russia.